Concept: The project started with the idea to keep the experience of sitting on a long bench, similar as those that lined the National Stadium. And the logic and beauty of bolting down the long planks became obvious. The planks are often subjected to harsh outdoor weathers, and when they disintegrate, the bolted planks become easy to be replaced. Decades later, the weather beaten planks with their old bolt holes are now designed for a new context. We were able to re‐interpret it to make it ergonomically better, and by using a curved steel frame with the bolt and nut system, it remains a coherent continuation of its past, and adds a strong flexibility to the production of the bench in any lengths. Studio Juju is a design studio established by Timo Wong & Priscilla Lui in 2009. Based in Singapore, Studio Juju works on product design and furniture, spatial design, conceptual and research related projects. In 2011, Design Miami/ honored Studio Juju as “Designers of the Future”. The young studio has begun to collaborate with international brands, most recently, Desalto (Italy), Living Divani (Italy) and W Hotels Worldwide. In 2012, Studio Juju was selected as one of the fifteen international designers to represent 15 years of Salone Satellite in Milan. 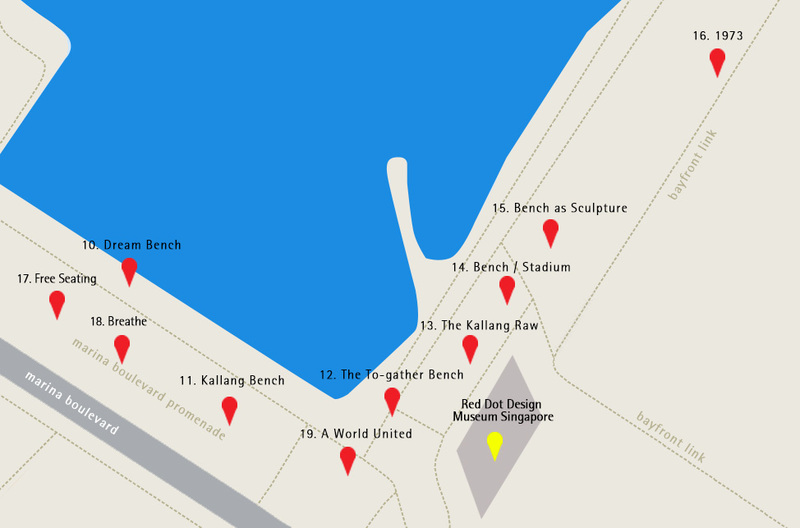 Kallang Bench is one of the public installations from the urban project, Benches. It can be found within 3 minutes walk along the Marina Bay Waterfront Promenade from The Promontory and within the vicinity of the Red Dot Design Museum.